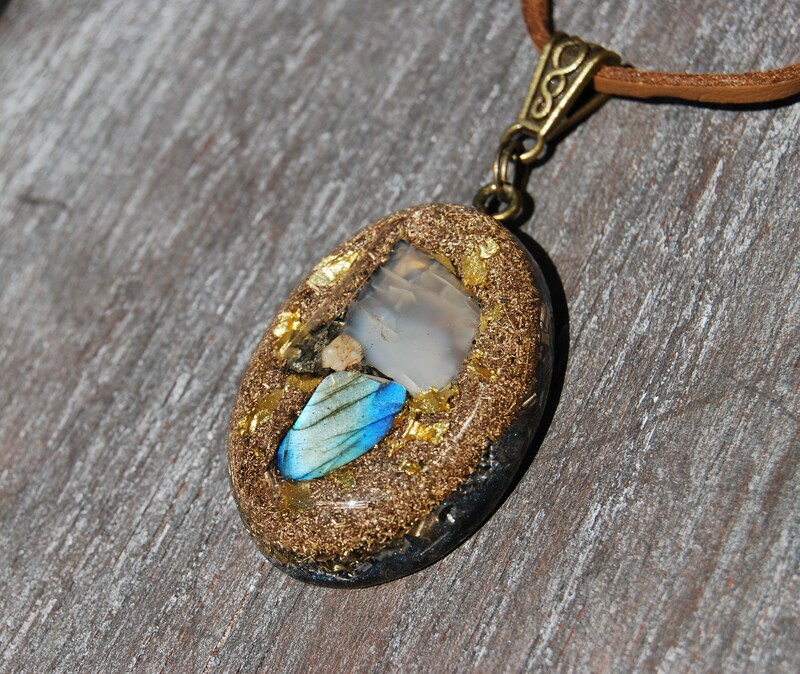 The main stones in this lovely Orgonite® pendant are Labradorite and Moonstone which you can see in the front. 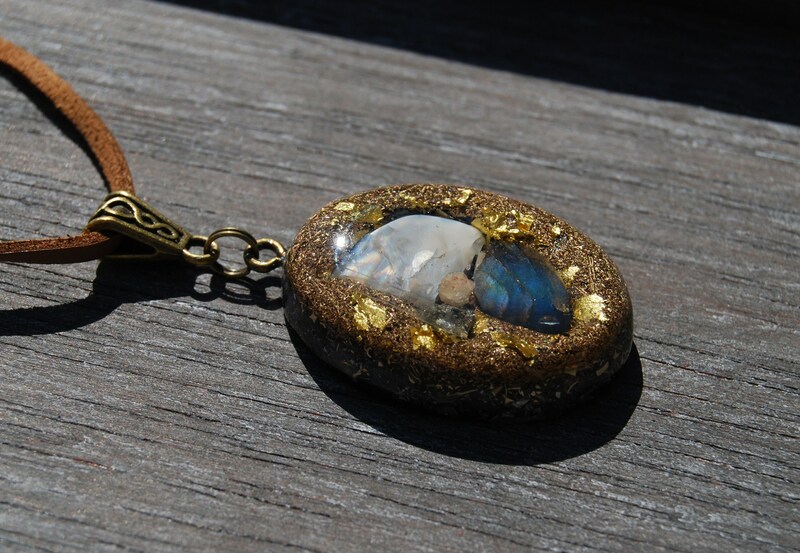 When the light shines a certain way on the Labradorite stone, it shows some lovely gold irisdescent colors then. It furthermore contains contains aluminium, brass and copper shavings. 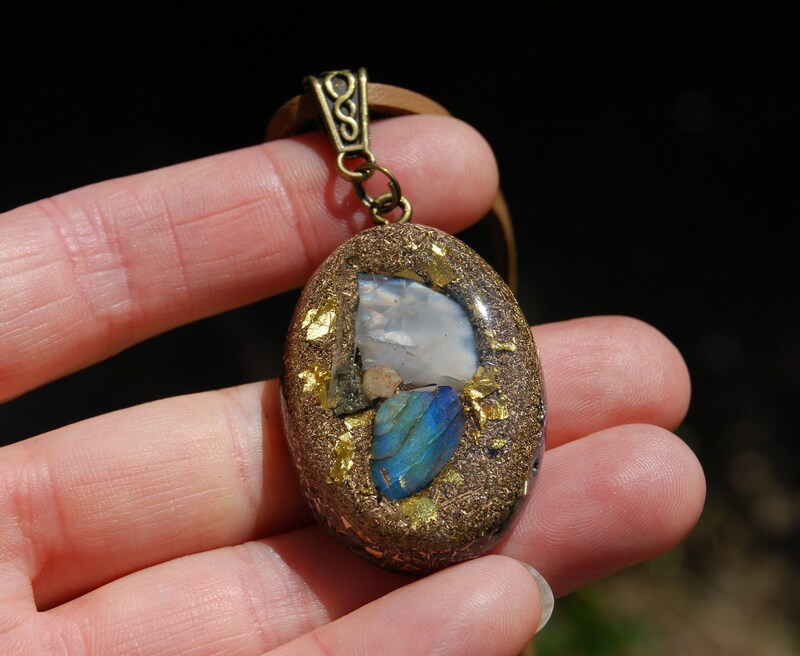 It consists of lots of metal shavings (bronze, copper, aluminium and brass) which is required for the pendant to properly clear stagnant energy according to William Reich's research. It also contains 24K leaf Gold. The pendant furthermore consists of black Tourmaline (protects, grounds excess energy and is piezo electric, pyroelectric). 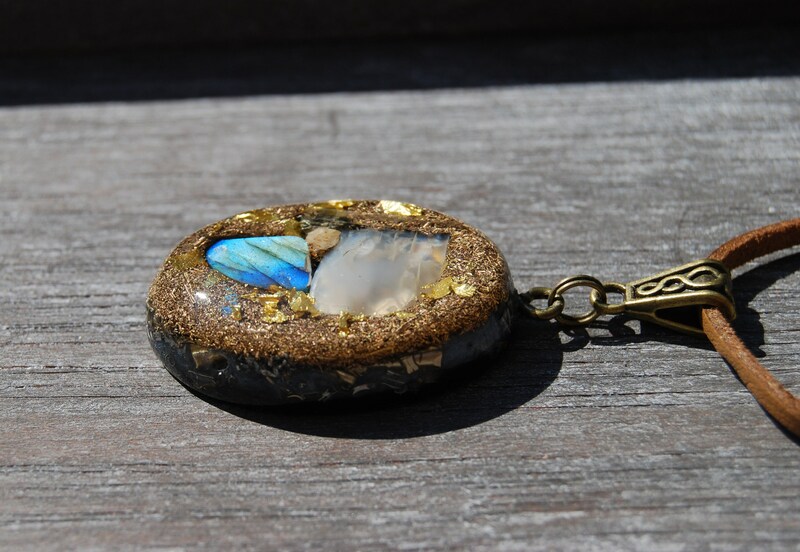 Furthermore it contains Rose Quartz (self - love), Pyrite (to enhance and protect), Rhodizite (to amplify), Selenite (to clear and charge) and a small clear terminated clear quartz crystal all within a durable resin setting. 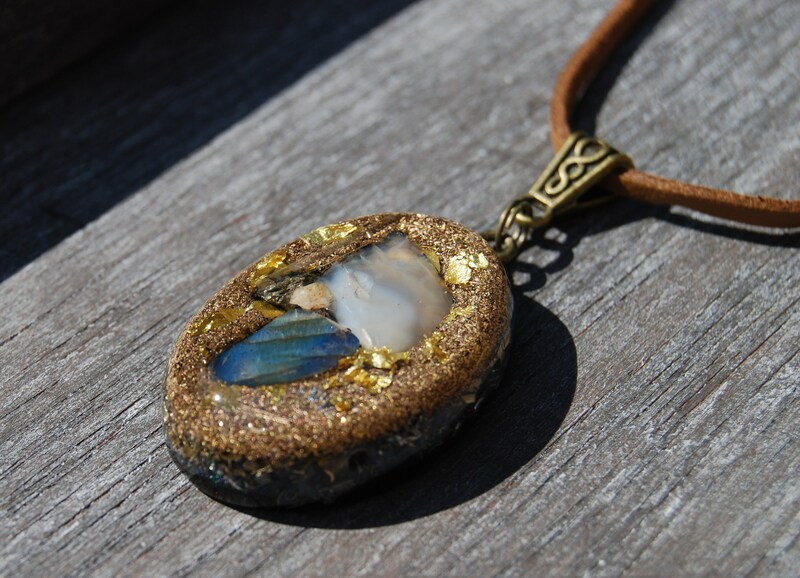 Moonstone has been used for centuries in a variety of cultures. Being a perfect expression of the yin, the soothing and mysterious energy of the moon, moonstone is the bringer of calm, peace and balance. The peace and calm that moonstone generates has a sensual, other-worldly quality to it; it is infused with an enchanting, soft glow of optimism and creative energy. 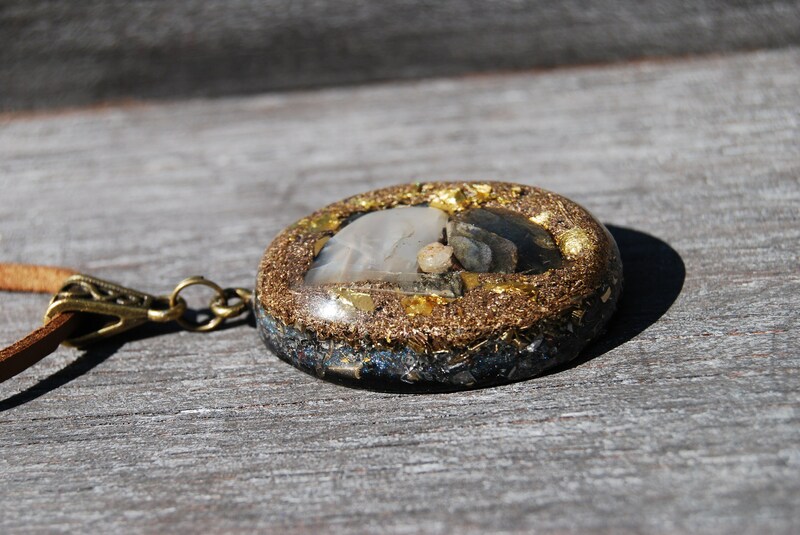 Pyrite makes a wonderful energy shield, blocking out negativity from various sources. for example it deflects ELF (extremely low frequency) waves.